When the Chicago Cubs win the whole city knows as the iconic "W" flag is hosted to its position atop the historic hand-operated scoreboard at Wrigley Field. 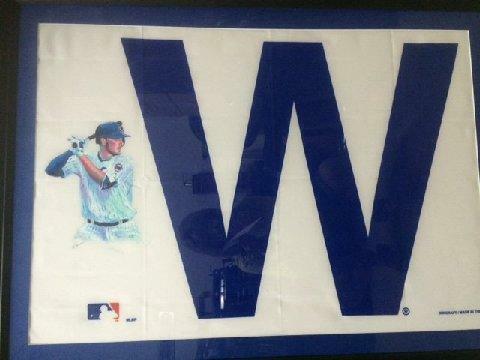 This is a "W" flag featuring the image of 2015 Rookie of the Year and Cubs third baseman Kris Bryant. This 27" x 38" flag features the art of noted sports artist Al Sorenson; it is a one-of-a-kind piece of sports memorabilia that any Cubs fan or collector would love to display in their home or office. This piece of art is custom framed and measures 32" x 42". Bryant was a 2016 All Star and is among the names frequently mentioned in discussions of the 2016 NL MVP. 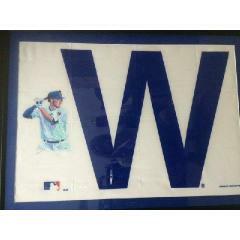 Add this beautiful piece of sports art memorabilia to your collection today. Due to the rare nature of this item we must charge your credit card for the full amount immediately upon taking your order. This policy ensures we reserve the flag for you. We will confirm your order by Email. This is a replica flag. Please allow 2 to 4 weeks for delivery.